Octopus fishing and more described by Emma Metcalf Beckley, 1902. Women Got the Octopus With Spears. The Hawaiians have five methods of fishing: by spearing, hand catching, baskets, hook and line, and with nets. Fishing for oopu and wi in Puepaku, Hilo, 1878. ¹Whereas the cry of the nene, “unele, unele,” is associated with lacking, the cry of the turkey, “pokeokeo,” is associated with riches. Ko Hawaii Pae Aina, Buke I, Helu 43, Aoao 1. Okatoba 26, 1878. There were a lot of fish in the reservoir of Wahiawa when it recently went dry; from Oopu, to Shrimp [Opae], Red Fish [I’a Ulaula], and Chinese fish [i’a Pake]. They were all taken by the Japanese and those of the area. How sweet tasting. So delicious! 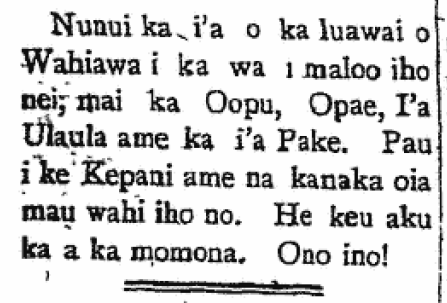 Kuokoa Home Rula, Buke X, Helu 36, Aoao 4. Sepatemaba 5, 1912.